Yesterday we had the great pleasure of attending the City of Parramatta’s official opening of a key piece of cycling infrastructure connecting the Parramatta Valley Cycleway. We have been working with the Local Council and our affiliated BUGs to ensure quality bicycle infrastructure is delivered and the Subiaco Creek link delivers on all fronts, providing a positive addition to the Active Transport options in the area. 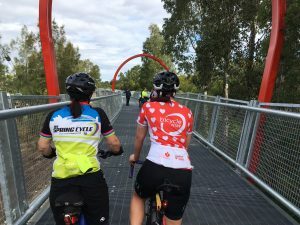 Cyclists and pedestrians can now travel on a high-quality, river front path from Parramatta Park to Sydney Olympic Park following the official opening of the Subiaco Creek link. Delivered on-time and under budget, the Subiaco Creek link will allow users to avoid approximately 1km of the street network, including the busy, steep and industrial South and Pike streets. It will now be possible to walk and cycle away from traffic for almost 20km on a path network between Parramatta Park and Sydney Olympic Park via Parramatta CBD and the Western Sydney University (WSU) campus in Rydalmere. “Subiaco Creek was one of the key missing links in the popular Parramatta Valley Cycleway, and we’re pleased to now see it open for the community to enjoy. The path is designed for pedestrian use as well as cyclists of all abilities,” City of Parramatta Council Administrator Amanda Chadwick said. 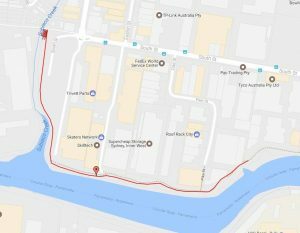 The $4.5 million Subiaco Creek link was funded by the NSW Government’s Priority Cycleways Program, which is delivering missing links in the cycleway network right across the state. The project has been delivered by City of Parramatta Council on behalf of Roads and Maritime Services (RMS). Member for Parramatta Geoff Lee said Parramatta was fast becoming the cycling capital of Western Sydney. “The Subiaco Creek link gives local residents, cycling and fitness enthusiasts more ways to enjoy and explore our beautiful local area. I hope to see many families and visitors make the most of this fantastic new link,” Mr Lee said. The cycleway was officially opened to the public on Monday 19 June.